I think we find ourselves at times improvising with “what we have left.” We may have based a task or goal on certain emotional, mental or spiritual habits. They change. We find ourselves with only “three strings.” So how do we improvise with “what we have left” to stay focused on our goals? I’m finding out. I have to admit a lot of bravado in my approach to water sports. I would boast to friends that if I ever capsized sailing, I would eventually drift to shore and get poison ivy. Kayaking? Who capsizes doing that? Once I launched my sailboat when the wind was too strong, convinced I could handle it. The feeling of being on the edge of capsizing was terrifying. I made it, but that feeling hasn’t left me. Then I capsized my kayak, twice in deep water. Both times I scrambled to safety, but I remember panic as I fell into the river. 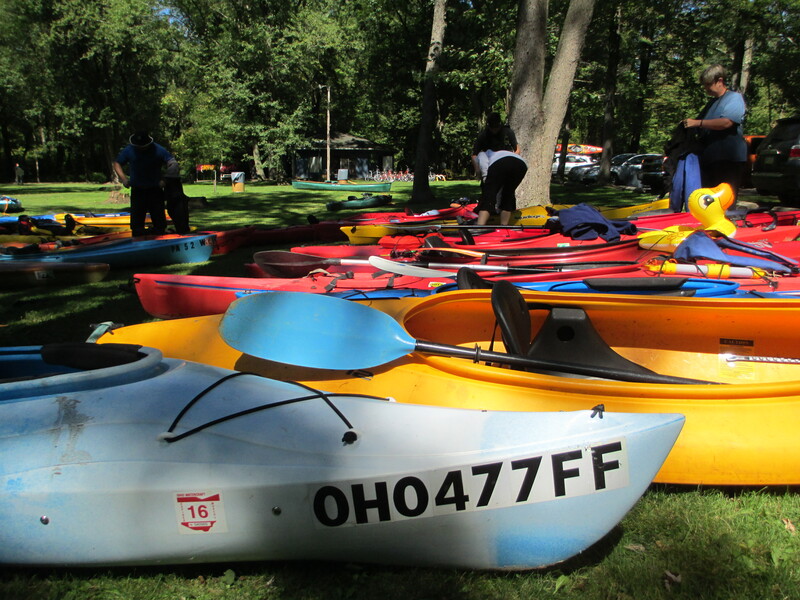 Kayaks at Riverside Park, Greenville, PA.
I’ve overcome those feelings to kayak regularly, but getting out my sailboat has been harder. I can’t blame the lousy weather totally…I have to admit my bravado is gone. Other life events have increased my feelings of vulnerability. I’ll sail again, but I’ll have to improvise on three strings. So, Lora, what ‘cha got left? * There may be issues with this story. See Snopes.com for their research. Thank you, Ellen and Nancy for your insights. So much to discuss, so little time! What a meaningful story! I’ve never sailed or kayaked, but there are other things that I have loved doing that now cause more ills than they cure. I like to think that what I must let go of frees me to concentrate on other things. It’s amazing how many activities must be eliminated when only one knee goes bad. Considering we have two knees, you’d think it wouldn’t be such a problem. Maybe working with what’s left is like boiling sugar water–eventually it may produce caramel. But if we don’t know when to quit boiling what remains, it may stick and ruin it all. I guess we have to keep our eyes on the pot and keep on stirring.